Principal interests are figurative, portrait, interiors, landscape (mainly en plein air) and still life, working in all mediums with majority of work in oil or acrylic. Now developing abstraction, under the influences of the St Ives Artists, in both figurative and landscape. 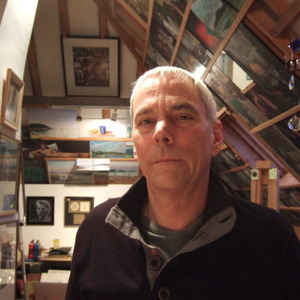 Associate member & former Honorary Treasurer of the Penwith Society of Arts in Cornwall, former Trustee of Penwith Galleries. Member of the Porthmeor Print Workshop.